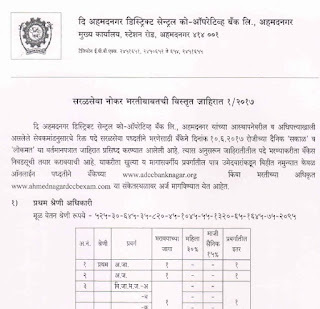 Ahmednagar District Central Cooperative Bank (DCCB) had released a notification through which it had invited applications for 156 Officer & Clerical posts. You can apply online up to 30 June 2017 via ahmednagardccbexam.com. For Jr Officer & Clerical: Degree in any branch / discipline. Eligible candidates can fill online application form via www.adccbanknagar.org or www.ahmednagardccbexam.com. Online form submission starts: 10 June 2017. For all details, you should check out the Ahmednagar DCCB Job notification from below.